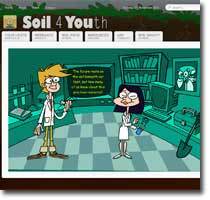 The project focuses on Canadian high school students with the following objectives to: (1) promote learning about the importance of soil as a natural resource through development of interactive online resources and (2) promote the discipline of soil science through a development of an open-access web site. The project is initiated through a national collaborative effort from six Canadian universities and by the Canadian Society of Soil Science. The web site will showcase a variety of Canadian research projects that address a wide range of land-use impacts on soil and illustrate career paths of soil scientists. Even though the program is aimed at Canadian high school students it will also be applicable in other parts of the world since soil as principles are universal regardless of the geographical/climatic region. The estimated number of students to be reached is about 5,000/year.